The names of the refugees and nun in this article have been changed to protect their identities. In a German convent, the church is now being used as a last-resort shelter for a group of Iraqi Yazidis whose asylum applications have been rejected. “It was clear in 2015 that we needed to respond in one way or another,” says Sister Stephanie, explaining why her convent opened its doors to refugees one year after the massacre of Yazidis in Sinjar, Iraq. The UN estimated that in August 2014, around 3,000 were Yazidis were killed and 6,000 were taken captive. “We’ll protect them because it’s clear that these people are refugees who have been through everything. We would take hundreds if we had hundreds of beds,” she says, adding that the convent is overwhelmed with requests for shelter. The practice of seeking sanctuary in a church is a centuries-old tradition across Europe and was written into medieval canon and common law in England between the 12th and 16th centuries. In Greek and Roman societies, temples could also harbour those in fear for their lives. The German “church asylum” movement started in 1983, when a church in Berlin tried to shelter a Turkish man, Cemal Kemal Altun, who eventually committed suicide during his deportation proceedings. A church offering asylum usually provides basic necessities such as accommodation and food. While many countries, UN and international organisations have recognised the genocide, EU countries are refusing the asylum applications of so many Yazidis. In 2015, an agreement rooted in tradition was signed between the church and the German Federal Office for Migration and Refugees. Under the deal, the state must tolerate church asylum while notices of deportation are reconsidered. Churches, in turn, have to notify the authorities about each case they take on. Several Yazidis in the convent have had their application for asylum in Germany denied because of the EU Dublin regulation, which requires asylum seekers to remain in the first safe EU country that they are fingerprinted in. Others face extradition to EU countries where they say they have been persecuted. The refugees Al Jazeera interviewed at the church also wished to remain anonymous, because of their asylum situation. All hope to remain in Germany. Among them is a family of three – Haider, 22, Samira, 21 and their 19-year-old cousin Amer. They say they have been told to return to Kurdistan where it is expected they can make a living. They have some family there, all of whom are currently unemployed and living in an unfinished building outside an IDP camp. They were trapped on Mount Sinjar for nine days when the Islamic State of Iraq and the Levant (ISIL, also known as ISIS) descended upon the Yazidi community in 2014. The siblings, alongside thousands of other Yazidis, took shelter on the mountain. They eventually walked the Balkan route to Germany and were fingerprinted in Romania. They say that they were beaten in Bulgaria. Their 53-year-old uncle is also in the convent and has had friends and family members who were murdered by ISIL. The uncle claimed church asylum after police attempted to deport him back to France. Saido, 28, another refugee, is now being told he must return to Bulgaria, but he is still hoping to find a way to bring his wife and four children, who are still living in a camp on Mount Sinjar, to Germany. Official statistics show that although the acceptance rate for Yazidis claiming asylum in Germany is now around 83 percent, this is a significant decrease from the 97.4 percent of Yazidi asylum requests granted in 2015. They currently have 12 Yazidis staying with them. “Church asylum is a last resort,” she says, adding that demand has increased since the beginning of last year. 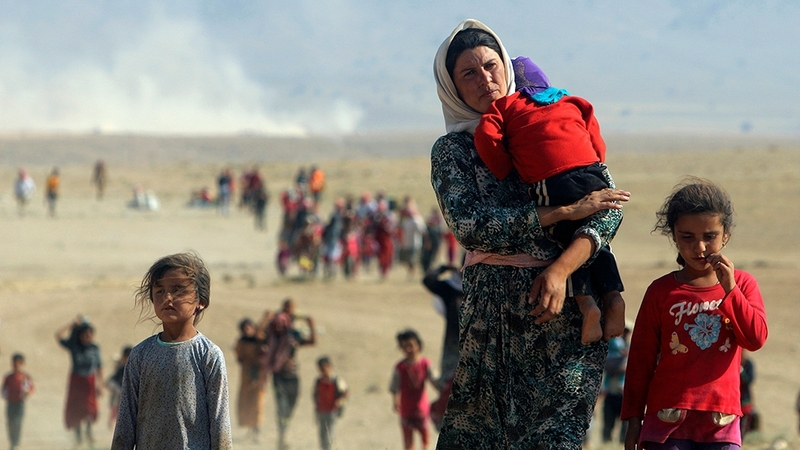 Elsewhere in Europe, 11 Yazidis in the UK are currently facing deportation back to Iraq. “While many countries, UN and international organisations have recognised the genocide, EU countries are refusing the asylum applications of so many Yazidis,” says Ahmed Khudida Burjus from Yazda, an organisation which supports victims of the Yazidi massacre. Human rights lawyer Amal Clooney is among those seeking the prosecution of ISIL in a court of law with Nadia Murad, a Yazidi woman who escaped ISIL captivity. As of yet, no member of ISIL has stood trial. For now, this small German convent will pursue its humanitarian work. In 2017, German churches managed to stop 1,478 planned deportations. In the first three months of this year, churches stopped or delayed more than 500 cases.